Welcoming all things spring today with these Flourless Ricotta Cupcakes! 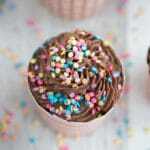 These mini cupcakes are super light, moist and chocolatey, and topped with the most delicious chocolate coconut cream. The perfect addition to your spring time celebration! We are just a few days away from Easter, and I’m currently thinking all things spring, pastels and chocolate! 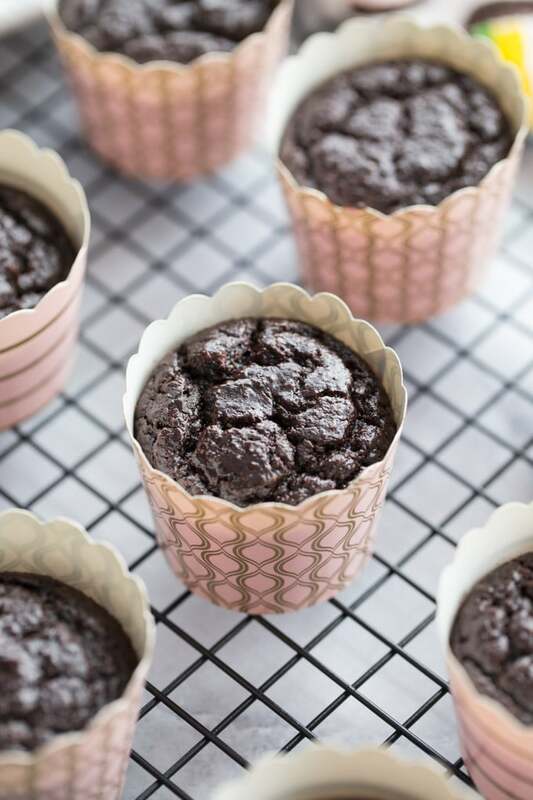 So naturally, I’m baking up mini gluten-free chocolate cupcakes and dreaming of carrot cake! That’s totally appropriate, right?! What are your plans for this upcoming Easter weekend? In addition to planning my weekend baking and celebrating spring, today, I’m celebrating my one-year blogiversary! The first post I ever shared on Crumb Top Baking was this recipe for Triple Berry Chia Jam, and I hit publish on March 27, 2017! In some ways that seems like so long ago, and in other ways it seems like yesterday! I’ve learned so much over the past year, and met so many lovely folks and fellow food bloggers along the way. And, of course, I couldn’t do any of this without my super supportive husband, family and friends! They were my first blog readers and continue to be my daring taste testers! I’m totally excited for the year ahead, and I continue to be grateful for all of you (talking to you reader and virtual friend! ), who take the time to visit my little ol’ blog every week! Thank you so much! So what better way to celebrate my year of blogging than to revisit one of my early recipes. 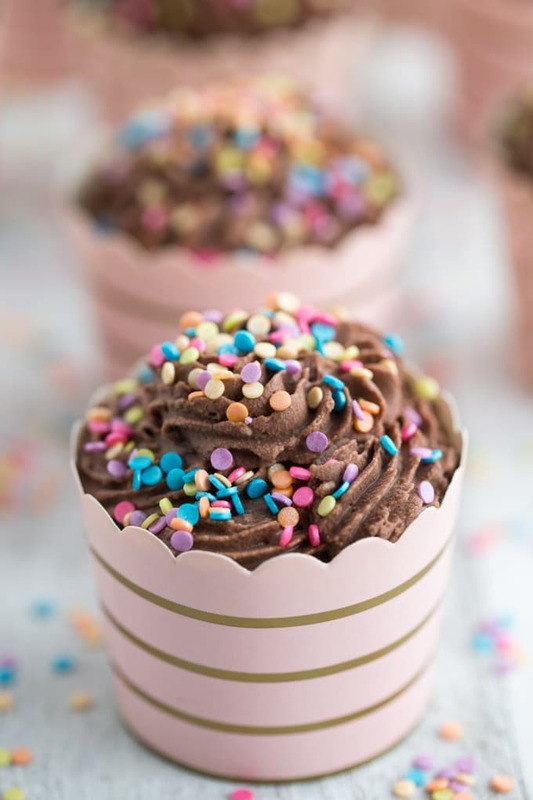 These Flourless Ricotta Cupcakes with Chocolate Coconut Cream were originally published in April 2017. But since that time, I’ve made some adjustments to the recipe, and updated the photos. So I thought the timing was perfect to share this revised recipe with you! You can make these Flourless Ricotta Cupcakes year round, but I think they work really well for spring brunches and afternoon tea parties (and yes, I totally want to host a tea party!). 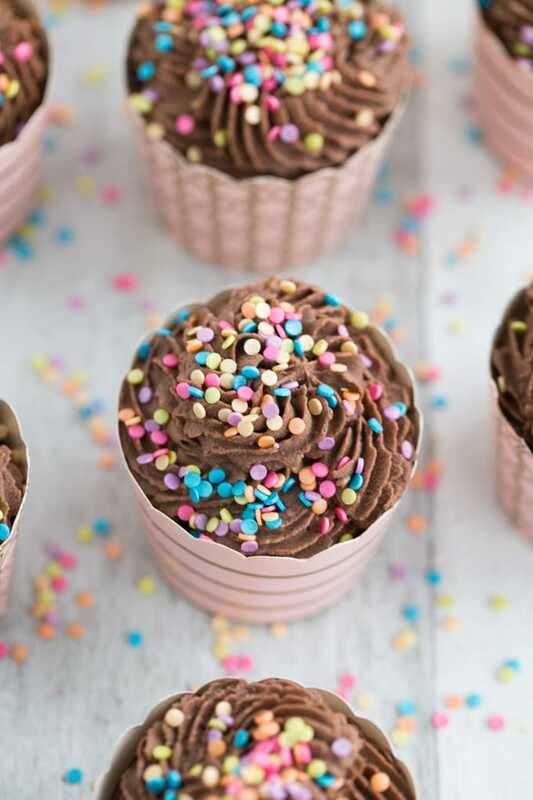 These cupcakes are chocolatey and taste a bit decadent, but they’re also bite-sized with a light texture, so perfect for occasions that call for just a little something sweet. I also love that these are gluten-free. The recipe calls for ground almonds, ricotta, cocoa, maple syrup, eggs, vanilla, baking powder and salt. Pretty simple ingredients. I don’t often eat a lot of dairy, but ricotta seems to work for me, and I love the texture it creates in these cupcakes. If you’re a long-time follower, you know I have a slight obsession with whipped coconut milk. It’s such an awesome dairy-free dessert topping and it goes perfectly with these Flourless Ricotta Cupcakes. Some other recipes I enjoy with coconut cream include this strawberry shortcake and this carrot cake. As usual, if you make these cupcakes, I would love to hear about it in the comments below. 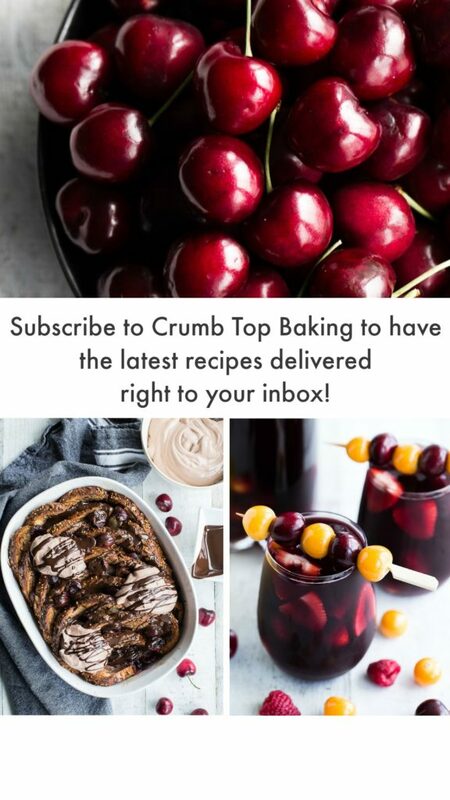 You can also follow Crumb Top Baking on Instagram, Facebook, Pinterest and Twitter and comment on my recipes there! These Flourless Ricotta Cupcakes are super light, moist and chocolatey, and topped with the most delicious chocolate coconut cream! 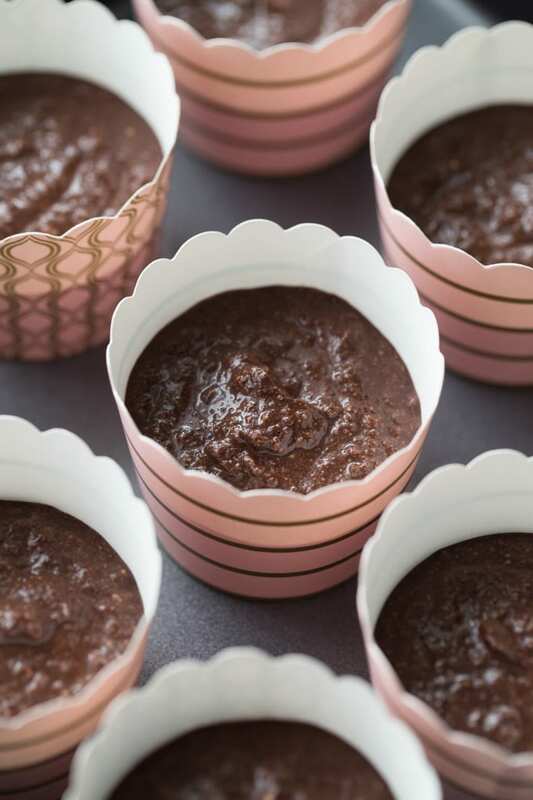 The perfect bite-sized, gluten-free dessert! Pre-heat oven to 350 degrees and place 9 small baking cups (not mini muffin liners) on a baking sheet or in a shallow baking pan. In a medium-sized bowl, stir together the ricotta cheese, maple syrup and vanilla. Next, whisk in one egg at a time. In a separate bowl, sift together the ground almonds, cocoa, baking powder and salt. Add the dry mixture to the wet mixture and stir until combined. Do not over mix. The mixture will look a little gritty, but this is just the texture of the ricotta cheese. 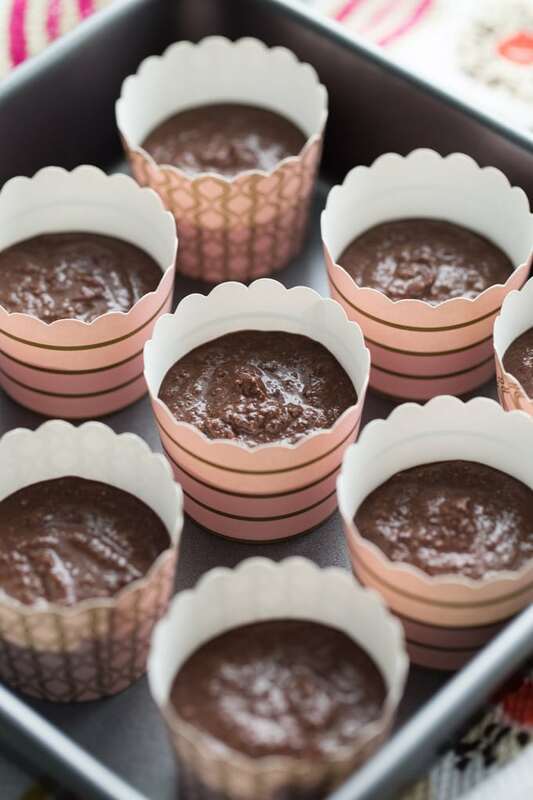 Add the batter to the baking cups, filling a little over half way. Do not overfill as the cupcakes will rise as they bake. Bake for 30-32 minutes, or until a tooth pick inserted in the middle comes out clean. Let the cupcakes cool on the baking sheet for 10 minutes and then transfer to a wire rack to cool completely. Open the refrigerated coconut milk and scoop out the solidified coconut cream and add to a deep mixing bowl. Using an electric mixer, beat the coconut cream on high for one minute. Scrape down the sides and add the maple syrup and cocoa. (To minimize the cocoa dust, just add the cocoa a little bit at a time, mixing for 30 seconds after each addition). Continue beating the coconut cream mixture on high until all ingredients are well combined and the cream is fully whipped. This could take a few minutes, so be patient! Add the coconut cream to a piping bag and pipe onto cupcakes, or spread on with a knife. Top with sprinkles or coconut. Store in an airtight container in the fridge and enjoy within 2-3 days. In order for the coconut milk to solidify and separate from the coconut water, the cans of milk must be refrigerated for 24 hours, or at least overnight. For a gluten-free recipe, ensure your sprinkles are gluten-free. This recipe was originally published in April 2017 but was updated and republished in March 2018. Haha! I hear ya! I should probably do a course or watch a YouTube video to improve my piping skills. In the meantime, sprinkles save the day! Thanks for your support Dawn. So glad we met through blogging! Cupcakes were delicious. Dad liked them too. Thanks Mom! Glad you both enjoyed! I don’t think any of that chocolate coconut cream would make it to the cupcakes! Just saying! These are so pretty Leanne. Thanks Mary Ann! The chocolate coconut cream does make a pretty nice dessert on its own! Thanks so much Katherine! Happy to call you a blogging friend too! And I also have leftover ricotta in the fridge, which will be perfect for your pasta recipe! ;) My hubby would love that creamy dish! I love how these baked up so light and fluffy, but have no flour! These cupcakes look DELICIOUS!!!! Thanks Kelly! The ricotta and ground almonds definitely create a light cupcake! Happy blog anniversary Leanne! These are such a fun way to celebrate and I LOVE that these are flourless! These look so easy to make and that chocolate coconut cream looks like one luscious way to top them off! Thanks so much Marcie! I definitely did a lot of celebrating with these cupcakes! ;) I could eat the chocolate coconut cream on its own, but I also love having it on hand to use as a pancake topping! So good! Happy blogiversary! I’m so glad we’ve become friends–your recipes are always so inspiring. I can’t wait to see what the next year brings for you! And I can’t wait to try these cupcakes :). Happy Easter, Leanne! Thank you Kelsie! I’m so happy to have met you through blogging! Your desserts are inspiring and drool-worthy! Hope you get a chance to try these cupcakes. Would love your opinion. Happy Easter to you too! Happy one year blogging! I’m just about there as well. These cupcakes look and sound incredible! And those sprinkles arnt hurting the selling point! Thanks Patrick! It’s amazing how fast a year goes by while blogging, right?! And yes, sprinkles definitely help to sell these cupcakes! Sprinkles just make everything pretty! Congrats on your blogiversary!!! These cupcakes look amazing and I am totally trying them soon. My piping skills are super mediocre so I might need a lot of sprinkles on top. Thanks so much Kim! That’s so sweet of you to say! I’m happy we connected here and on Instagram. Love seeing your beautiful treats show up in my feed! Happy first blogiversary! I can’t think of a better way to celebrate than with chocolate cupcakes. They look amazing! Thanks Starr! I agree! 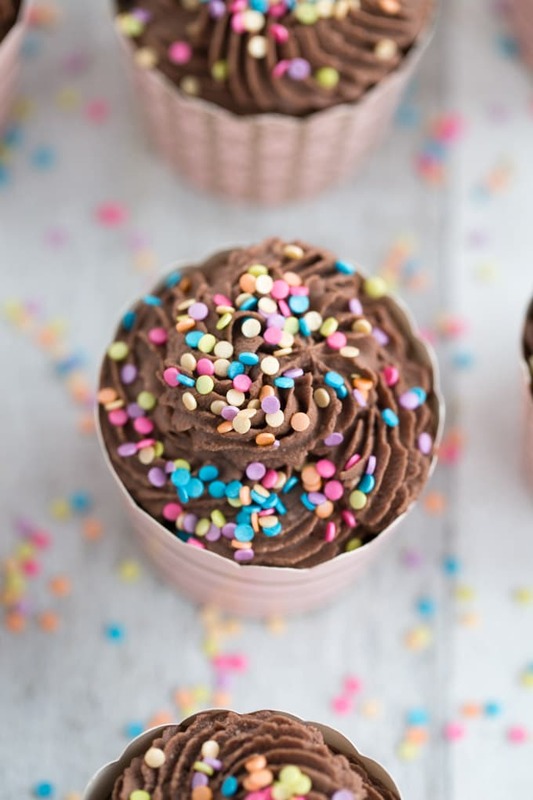 Chocolate cupcakes are a great way to celebrate! Happy 1-year blogging! These cupcakes are phenomenal. I might be biased but I love ricotta in baked goods!! And that chocolate coconut cream topping, amazing! Thanks Nicoletta! I love the ricotta in these cupcakes. I really should bake with ricotta more often! And the chocolate coconut cream topping is one of my go-to frostings! Thanks Dana! The ricotta definitely keeps these cupcakes moist and cakey! Happy 1st-year blogiversary, Leanne! 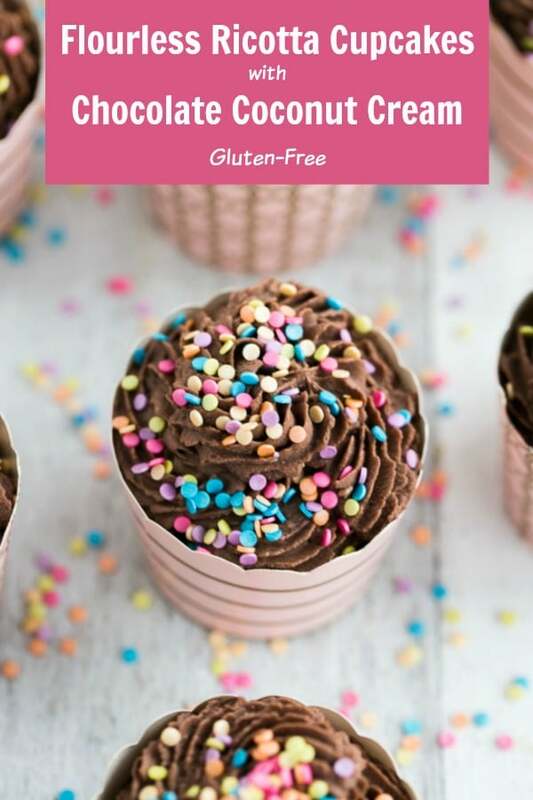 I am delighted to see your recipe because I have two grandchildren who are gluten and dairy free. Your cupcakes will be a hit for sure! They are adorable!